Although seafood tends to be low in calories and can be an effective food choice for weight loss, not all recipes made with seafood are beneficial for slimming down. Tuna salad is a particularly bad choice, as it's high in fat and calories, a combination not conducive to weight loss. Consult a doctor before attempting to alter your weight through diet or exercise. 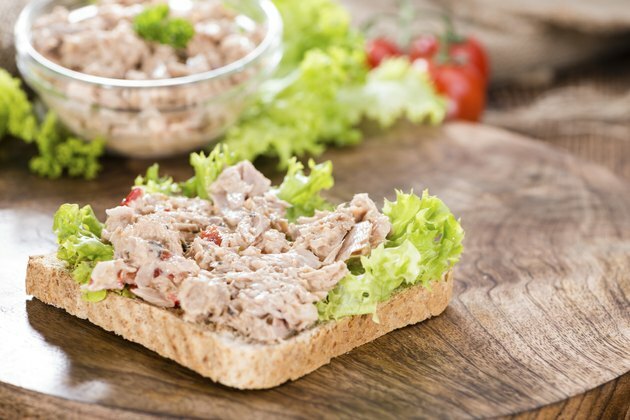 Tuna salad is calorie-dense, meaning that small servings provide a lot of calories. Each cup of this food contains 383 calories, an amount constituting 19 percent of the daily recommended intake of 2,000. Consuming high-calorie foods, particularly those that do not provide a large volume, can make it difficult to lose weight, as you need to consume fewer calories than you burn each day to lose weight. It takes a deficit of 3,500 calories to lose 1 pound of fat. Tuna salad is high in fat. Each cup contains 19 grams of total fat, with 3 grams of saturated fat. High-fat foods pose several problems for weight reduction. First, fat contains more than twice the amount of calories as protein and carbohydrates. Additionally, research from the May 2001 edition of "International Journal of Obesity and Related Metabolic Disorders" indicates that your body burns fewer calories digesting fat than other nutrients, and fat is less filling than other nutrients. Tuna salad is high in carbohydrates, with 19 grams per cup. Although you can lose weight while consuming carbohydrates, research published in the July 2008 edition of "The New England Journal of Medicine" indicates that low-carbohydrate diets are more effective for weight loss than diets higher in carbohydrates. Not all types of carbohydrate are detrimental for weight loss. Dietary fiber can increase feelings of fullness, so it may aid in appetite control. Unfortunately, none of the 19 grams of carbohydrates in tuna salad come from fiber. One benefit of tuna salad for weight loss is that it's high in protein. As research from the May 2008 issue of "The American Journal of Clinical Nutrition" notes, protein can increase satiety and promote a higher rate of calorie burning than other nutrients. Each cup of tuna salad contains 33 grams of protein.